Unique System FZE, a Unique Maritime Group company, which is one of the world’s leading integrated turnkey subsea and offshore solution providers, completed the handover of a new hyperbaric treatment system to Captain Ismail Hassan Al Housani, Officer-In-Charge of Diving Chamber and Rescue Department. The scope of this project was to design a system for installation in the Dubai Police Clinic, using an existing shell once owned by the Dubai Police. The principal role of the system is to provide the Police Rescue Department with the capability to treat local sports and police divers that may suffer a diving related injury. 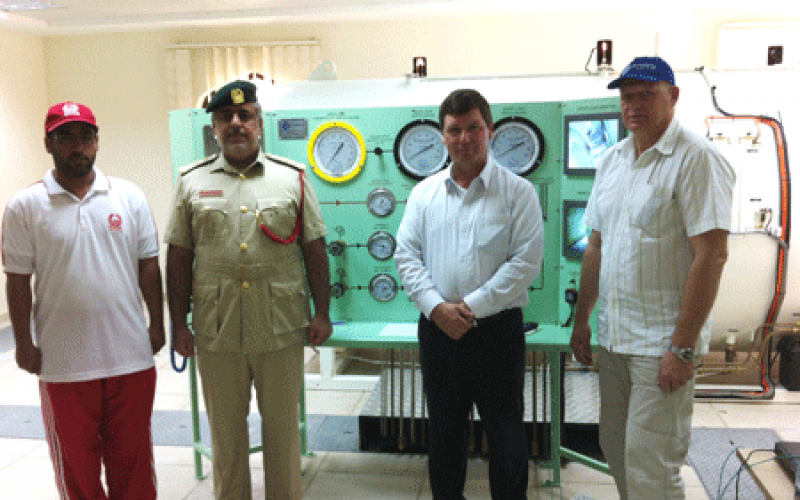 It is believed to be the first hyperbaric treatment centre available to the police and general public in the region. The project has already attracted a great deal of interest amongst senior police officers and medical professionals. Captain Ismail said “We are extremely pleased and delighted with the system. A number of senior police officers were amazed at the transformation of the original shell and new console. An official opening ceremony will be held at the facility shortly and Unique will be invited to attend”. Special commendations go to Arun Nair – Project Engineer for developing the panel design, chamber and to Alexander for building and installing the system. They have also been busy helping to familiarize Captain Ismail and his team with the operation and maintenance of the system. Ian Huggins, General Manager at Unique System FZE commented “We are very proud of the successful completion of this project and as a result there have been a number of discussions about future upgrades and a service management packages too. We will be happy to assist Dubai Police for such packages and look forward to work with them”.